A key challenge in many countries in the developing world especially Africa is on how to balance economic growth with environmental sustainability. Many of these countries are striving for emergence or transition to economic growth and the media is supposed to play a critical role in holding governments officials, corporate leaders and other stakeholder accountable in the management of valuable albeit scarce resources emanating preponderantly from the environment. According to the Millennuim Development Goals, which the United Nations outlined in 2000, balancing economic growth and environmental sustainability will help ensure development, political stability as well as peaceful transition towards democratic governance. To achieve these, the media has to effectively play its role of probing beneath the surface for news and dig deeper to find the intricacies behind current environmental events and problems, to better inform the different stakeholders and the public, thus permitting governments to be better armed to face emerging challenges. At the just ended training workshop for African Journalists and communication officers on climate change organised by PACJA in Nairobi Kenya, journalists were unanimous on the need for putting in place a strong network of environment and climate change media group in Africa, with the objective of informing on environment issues from an African perspective, indicative of the critical importance of the press in accompanying development actors in addressing issues affecting the lives of people in their community in particular and the continent at large. In a continent where climate change issues are not a priority in the curriculum of schools, be it primary, secondary or universities, it is not surprising that the population rely preponderantly on the media especially community radios and local newspaper, TV challels for information about climate change in particular and environmental sustainability in general. The long term sustainable development of the different countries in Africa like that of other countries across the globe is functional to the level which each has developed and implemented its environmental policies. Experts have neatly demonstrated the strong inter-connection between very good environmental policies and very strong economic development. Many countries are embracing the green economy in line with the Agenda 21 and Rio + 20 held in Brazil to find concrete strategies to fight climate change and generate economic stimuli. It is but imperative that the media in Africa accompany the different governments and the continent as a single voice towards this lofty struggle. 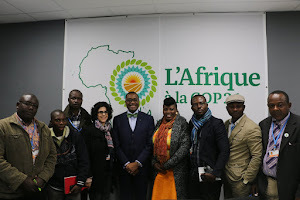 Thus the birth of the Pan African Media Alliance for Climate Change, PAMACC comes in handy to accompany governments and the continent towards this goal. Green Journalism needs to work in tandem with the different stakeholders towards achieving Green economies. With the assistance of the Pan African Climate and Justice Alliance, PACJA, a continental coalition of over 500 civil society organizations in the African continent, PAMACC will promote and provide accurate and high quality environmental reporting and training, help engage the public and governments in a policy dialogue, as well as help citizens become more environmentally conscious to protect their interest such as improving access to portable water, energy services, forest protection, health care etc. PAMACC is born and has come to stay. Long live Green Journalism in Africa.